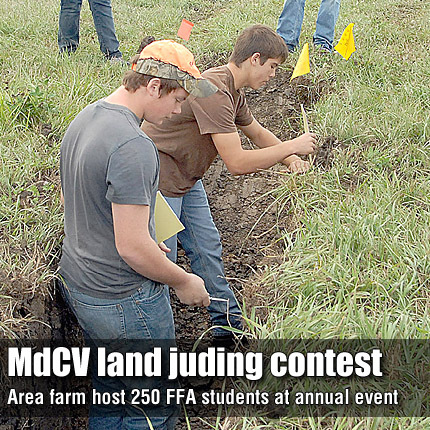 Participants check soil depth and analyze subsoil at the land judging contest hosted by MdCV Sept. 21. MELVERN—More than 250 Future Farmers of America (FFA) members from 20 chapters gathered Sept. 21 at Coleen Rice’s farm near Melvern for the East Central District Land Judging Career Development Event. The event began with registration at the Melvern Community Center in Melvern, and was run by the Burlington, Prairie View and Marais des Cygnes Valley FFA clubs, with the help of volunteers from MdCV High School. The five members of the MdCV FFA chapter had finished ninth out of 20 teams. Robert Nance placed seventh individually with a score of 446. Derek Wilson, Logan Cox, Wyatt Jordan and Chris Sowers also competed. The next contest for the MdCV FFA will be the horse and dairy cattle judging Oct. 11 at Johnson County Fairgrounds.